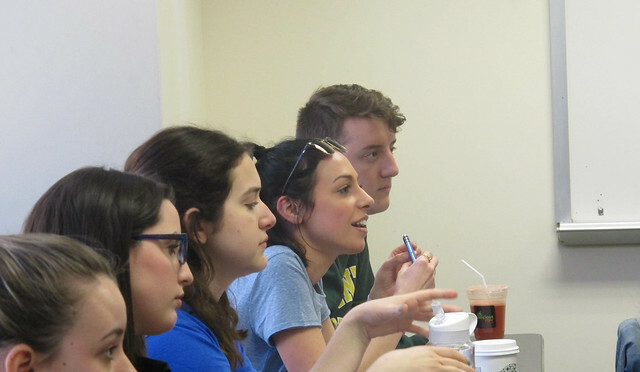 Brittany Cavallaro, author of the poetry collection Girl-King and the young adult novel, A Study in Charlotte, led a master class and public reading April 14 at Point Park University. In her master class, Cavallaro provided students with techniques to improve their writing across all genres including the use of anaphoras, the deliberate repetition of the first part of a sentence in order to achieve an artistic effect. "I learned from Brittany that there are so many ways to approach writing and that there are so many topics to choose from and have fun with," remarked Emily Watson, a senior creative writing major. "As a writer, I draw inspiration from other writers. During Brittany's master class, we practiced writing imitations of a poem. This exercise helped me practice form and mimic the same techniques the author used," explained Paige Mastrippolito, a junior creative writing major. Cavallaro also encouraged students to listen to their subconscious when writing and discussed strategies for "writing yourself into a poem." "I like work that is wildly ambivalent," Cavallaro told the students. "My favorite master classes are the ones where students don't just hear an author's opinions on the art of writing, but get hands-on experience with new ways of writing," said Sarah Perrier, Ph.D., associate professor and chair of the Department of Literary Arts. "Where else but in a master class like this one can people write 90 poems in 90 minutes?" added Perrier. "It was an honor to be taught by someone like Brittany who has great credentials," said Jeremy Eiben, a freshman theatre production major. At the public reading on campus, Cavallaro read from her collection of poetry as well as an excerpt from her young adult novel. "I enjoyed hearing Brittany explain how her characters were based off of Sherlock Holmes and Dr. Watson and the process she went through to decide which characteristics to give to each character," said Mastrippolito. "Through these writing workshops, I have learned how to write in different genres and my professors have helped me develop my craft and become a better writer." The Point Park University Writers' Series presents public readings and master classes throughout the academic year. Previous featured speakers have included poets Marcus Wicker, Karyna McGlynn, Eduardo Corral, Sandra Beasley and Mary Biddinger and writers Stewart O'Nan, Ivan Rodden, Brigid Pasulka and David McGlynn. Learn more about the creative writing program at Point Park and meet the Literary Arts faculty.